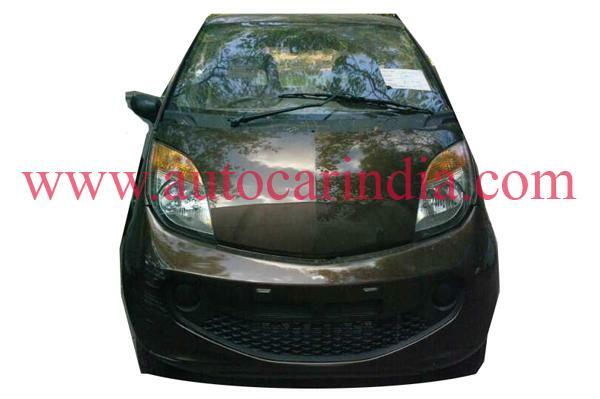 The Tata Nano diesel has been testing for quite sometime now. Indian Autos Blog was the first to bring you spy images of the Nano filling up on diesel at a fuel station. 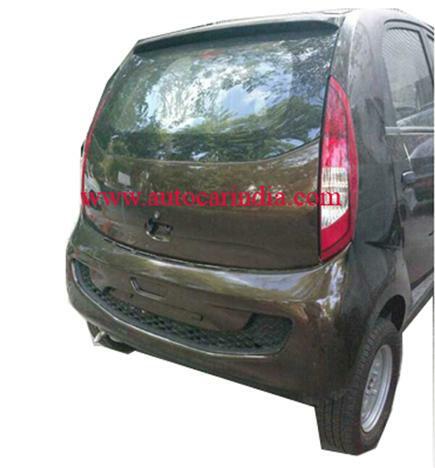 Autocar India claims that the images you see here are that of the Nano diesel. While there is no solid evidence to suggest that, it appears that this is definitely a Nano with a different engine. What is most interesting is the rear hatch. As you can see, this Nano sports a proper hatch door as evidenced by the boot handle and the key hole for unlocking it. The design of the rear windscreen is also different as is the rear bumper which seems to sport a large air inlet, for cooling the diesel/bigger petrol engine underneath. The front bumper has a complementing design. It is believed that the turbocharger for the Nano diesel would be supplied by Garret, one of the world's leading companies for turbo units. It was from their website that we learnt the Nano diesel could be powered by an 800cc engine producing about 40bhp at 4,000 rpm. Tata seems to be taking a step-by-step approach with the Nano, having announced the 2013 MY and the CNG emax models at the HORIZONEXT 2013. Can we expect to see the diesel Nano at Auto Expo 2014?